Toddlers need and seek order in their environment. If you want some work to call to a child -- make it beautiful and make it orderly. If they have to go gather all the "parts" of a toy or work, they are likely to get distracted, overwhelmed, or just plain frustrated and give up. 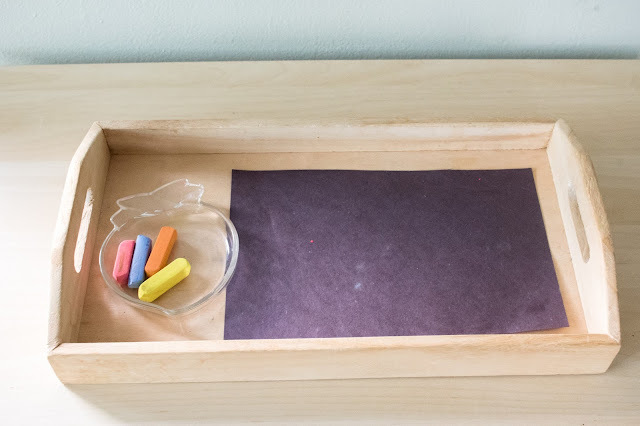 This is one of the vital reasons for organizing materials onto trays/baskets in a Montessori space. 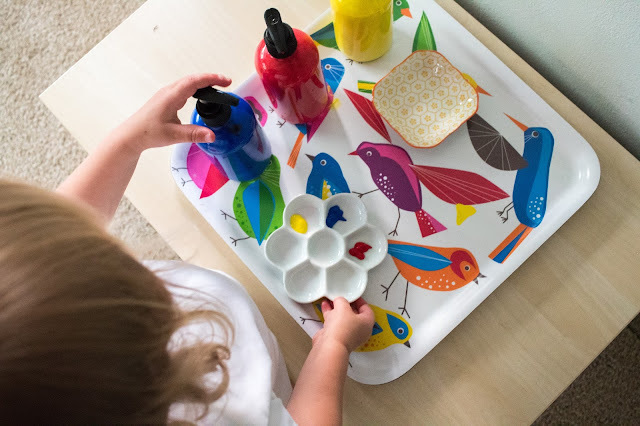 Art work is no different for toddlers, they need the order that comes with a tray. 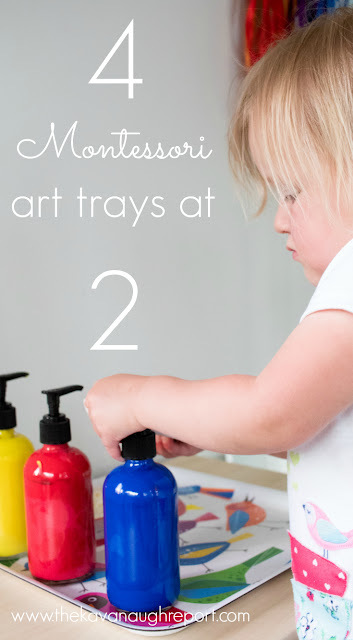 So organizing art into trays is often the best way to engage young children in artistic exploration. 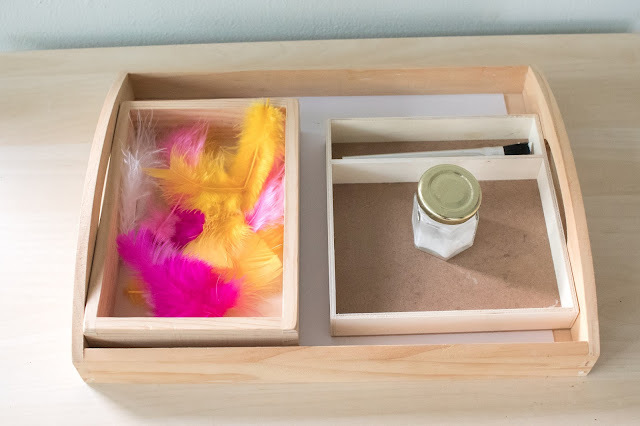 Then, as children get older, they can handle access to more open ended materials. 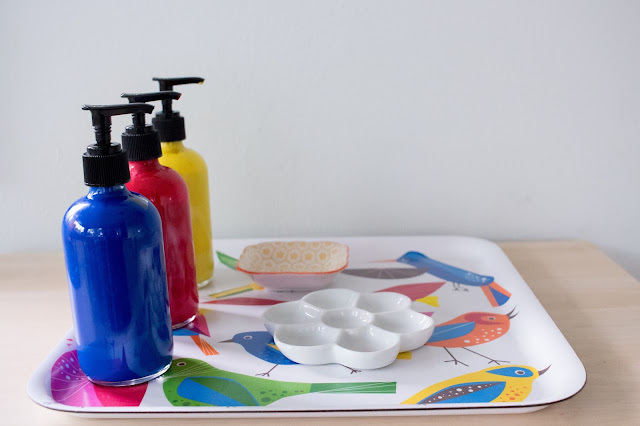 I have shared some of Nora's art trays before, but here are 4 more art trays at 2! At nearly 3-years-old, Nora is starting to get more comfortable with open ended art supplies, but still isn't quite there. She likes pulling out a tray and using the work. This isn't to say she can't be creative or that I direct her to use the tray in some way -- I don't -- it's just that she has everything she needs in one easy to access place. 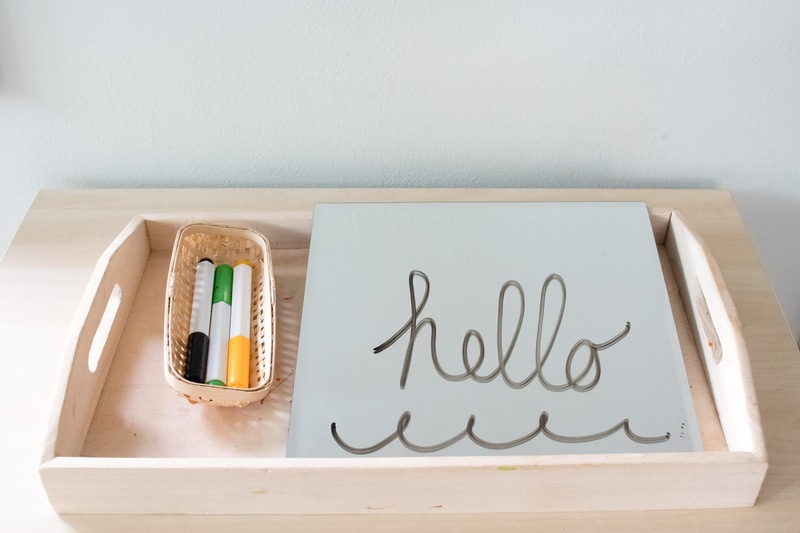 On this tray, Nora has a large mirror, some dry erase markers and a fabric eraser. Obviously, I wrote on this tray for the picture, but she can draw and erase to her hearts content. This has been a favorite for her, and for Henry (6-years-old) for some time. Here Nora has a small collection of pastels and some black construction paper. The color of the paper really makes the pastels pop. Small pieces help to encourage proper pincer grip. The pastels themselves are interesting and vibrant to use. On this tray is some collage work. I provide some interesting thing to glue to paper. We did foam bits for awhile, then moved to paper, sequence and now feathers. Nora really likes this work so it has stuck around for awhile! When Nora was learning to paint, we stuck with watercolors because they were less messy. Now that she's a bit more controlled, we have introduced tempera paint as well. We use the hand pumps for her to get the paint into the small paint tray. We provide 3 colors so she can mix as she pleases by experimenting with the pumps. The other small tray is where she can rest her brush. Then, she paints at an easel. Does your toddler like art? What kinds of things has she/he been working on? Where do you find the pumps for the paint?